The Senate bowed to White House pressure last night and passed a Republican plan for overhauling the federal government's terrorist surveillance laws, approving changes that would temporarily give U.S. spy agencies expanded power to eavesdrop on foreign suspects without a court order. That's not all it gives. The 60 to 28 vote, which was quickly denounced by civil rights and privacy advocates, came after Democrats in the House failed to win support for more modest changes that would have required closer court supervision of government surveillance. The 60 supporting votes came from all 43 Republicans, plus 16 "Democrats" and the "Independent" Joe Lieberman. 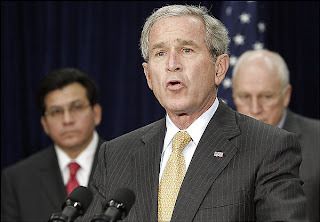 Earlier in the day, President Bush threatened to hold Congress in session into its scheduled summer recess if it did not approve the changes he wanted. This is how subtly things are done now -- if the Congress doesn't give the president what he wants, they'll have no summer vacation. Last year, the administration mounted a similar high-pressure campaign on the eve of a congressional recess, to revise legislation governing the interrogation and trial of detainees. It's almost ludicrous. It is ludicrous. It's almost if you don't clean up your room you can't go out and play. But rather than cleaning up its room, Congress is being asked to concede more of the Bill of Rights to an executive intent on accumulating as much power as possible. Thus the destruction of post-democratic America continues. The legislation, which is expected to go before the House today, would expand the government's authority to intercept without a court order the phone calls and e-mails of people in the United States who are communicating with people overseas. That's not all it would expand. And the chilling thing is, Bush doesn't even need it. The legislation will "give our intelligence professionals the essential tools they need to protect our nation," [White House] spokesman Tony Fratto said. But this is yet another lie: our intelligence professionals already have all the tools they need -- all they lack is the freedom to expose the truth! In order to protect our nation from another 9/11, we would have to find out what happened on the 9/11, and that is the one thing that must never be allowed to happen. We would have to shed the fiction that the Bush administration was somehow incompetent when it chose to ignore the warning signs. We would have to shed the fiction that al-Q'aeda terrorists working from a cave and armed will cell-phones and box-cutters somehow orchestrated the greatest concentration of war-games ever staged, effectively stripping the Eastern Seaboard of its air defense system. And that's just for starters. This bill further weakens the FISA system that was already weakened in the wake of 9/11, after which the administration said it had everything it needed to fight the so-called Global War On Terror. But there was still a modicum of oversight, and that's the other thing -- aside from the truth about 9/11 -- that this administration will not permit. Congressional Democrats and the White House clashed throughout the day not only over the scope of the changes in the law but also over whether the other side was bargaining in good faith. Democrats said they were convinced that their proposal met key the demands of Director of National Intelligence Mike McConnell, and House Majority Leader Steny H. Hoyer (D-Md.) quoted him as saying that the bill "significantly enhances America's security." But Republicans cited a letter from McConnell yesterday afternoon calling the proposal unacceptable and warning that it would prevent him from protecting the country adequately from terrorist attacks. "We did everything he wants," Brendan Daly, spokesman for House Speaker Nancy Pelosi (D-Calif.), said of McConnell, "and now he says he doesn't like the bill. They didn't move the goal post; they moved the stadium." This is how it's done. They always move the stadium. We're six and a half years into it, and still just noticing? Pelosi herself accused the Republicans of not caring "about the truth." This is not only false but it's also misleading. Republicans do care "about the truth". They always want special treatment for the truth -- they want to see it buried as often as possible -- and they usually get it, because Democrats such as Nancy Pelosi don't care about the truth. In fact, the Democrats currently in Congress -- especially Nancy Pelosi -- have made it clear that they don't even care about the people who elected them, who want above all else for these very same Democrats to start acting like an opposition party and stop this rogue administration in its tracks, regardless of their summer vacation schedules. White House officials disputed Democrats' account of the tentative deal, and Republicans said McConnell's objections were justified by the Democrats' decision to subject more surveillance to oversight by a special intelligence court than the administration wants. What the administration wants is no meaningful oversight at all from any court, special, intelligence or otherwise. The "compromise" the administration has offered makes this quite clear: no oversight until 120 days after any surveillance has started, and then court oversight only on generalities, not on specific cases. "We have worked hard and in good faith with the Democrats to find a solution," Bush said at a news briefing after a meeting with counterterrorism officials at FBI headquarters yesterday morning. "But we are not going to put our national security at risk." As usual, none of this is true. One of the problems with our national discourse is that when Bush and his friends speak of "national security", they don't mean what most people think they mean. They mean their own security, Bush's continuing tenure in office, and so on. They couldn't care a bit less about the security and safety of the nation and its people and they have made that abundantly clear, time after time after time. As Bob Parry points out, terrorists know about government surveillance. They assume that their email and cell phone communications are being monitored. The terrorists also had no reason to know or to care that the U.S. government was or wasn’t getting wiretap approval from the secret court created by the Foreign Intelligence Surveillance Act. They simply took for granted that their communications could be intercepted and acted accordingly. It never made sense to think that al-Qaeda terrorists suddenly would get loose-lipped just because the FISA court was or wasn't in the mix. The FISA court rubber-stamps almost all wiretap requests from the Executive Branch for domestic spying, and overseas calls don’t require a warrant. The reality is not reflected in mainstream media accounts, and there's usually no hint of it to be found in the statements of our Congressional "opposition". But this legislation is not about protecting the people of the United States from terrorists. It's about protecting the illegitimate and unelected rogue government of the United States from its own people. Not that they pose much of a threat.